Malahini Kuda Bandos could be described as the New Jersey of the Maldives – the affordable property Garden (Villa) State in the northeast of the country just across the harbour from the high rises of the local metropolis whose skyline rises out of the horizon with unsung touches of distinction in its own right. 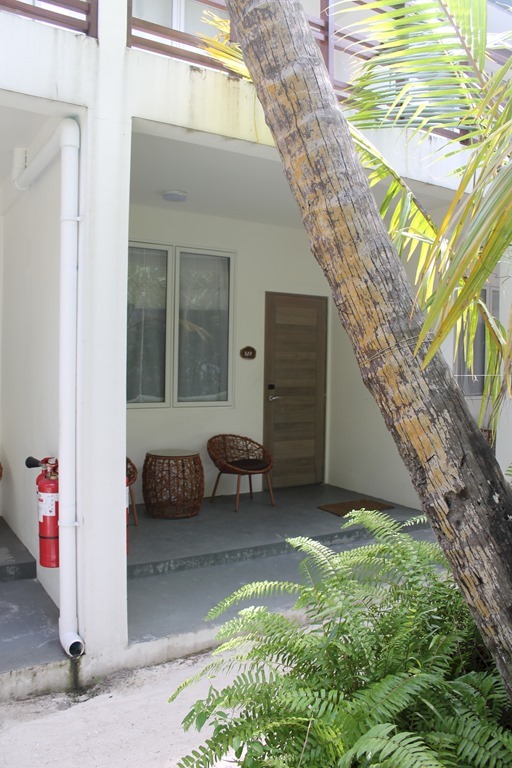 The resort has more Garden Villas – 32 – than any other room category. In fact, more than any other resort except for Kuredu who does have a handful more, but also is an island literally ten times larger as well. Our stay there was only the third time we had stayed in a garden villa. And the villas were the most modest of all the ones I had ever seen. Two story apartment blocks facing each other in tight proximity on the inside of the island. But the blueprint is a sensible way to get an optimal number of guests on a small island without spoiling too much of the beach and other common areas. 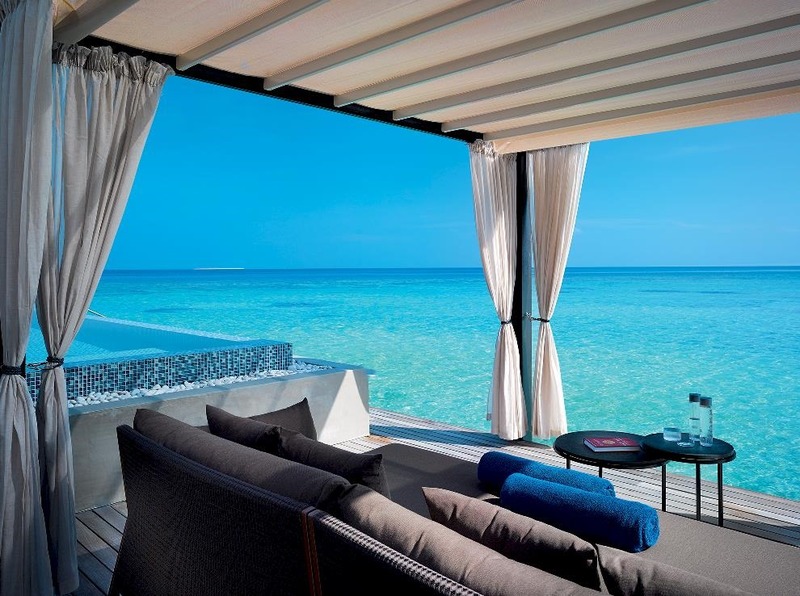 As a result, like the residents of “Joisee”, visitors can find some of the lowest priced packages in the Maldives (especially when factoring in the low transfer cost being so close to Male). 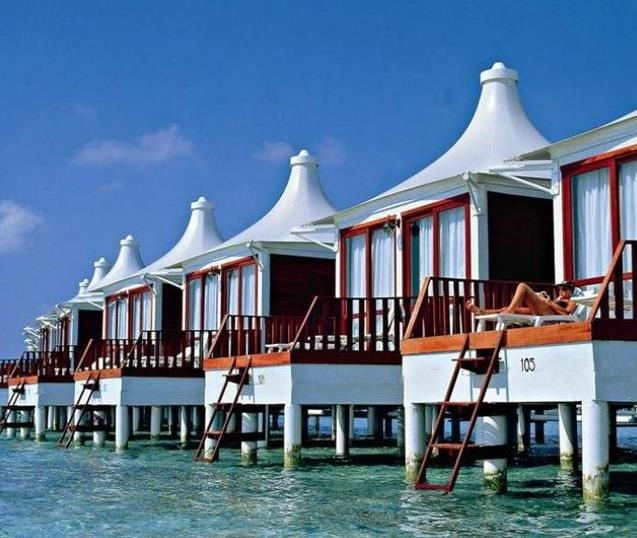 Maldives snobs might poo-poo anything less than a thatched roof private villa with ocean views, but they forget that such apartments are where many people on their beach holidays all over the world. These rooms just happen to be in the middle of an island paradise. Great covers aren’t limited to pop songs and fashion mags in the Maldives. 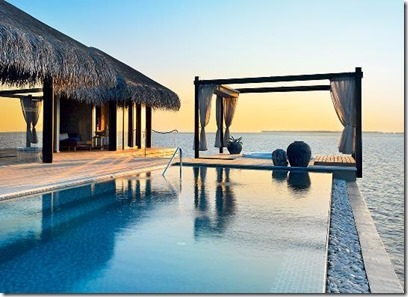 Their thatched roofs are a world recognized icon of tropical paradise. 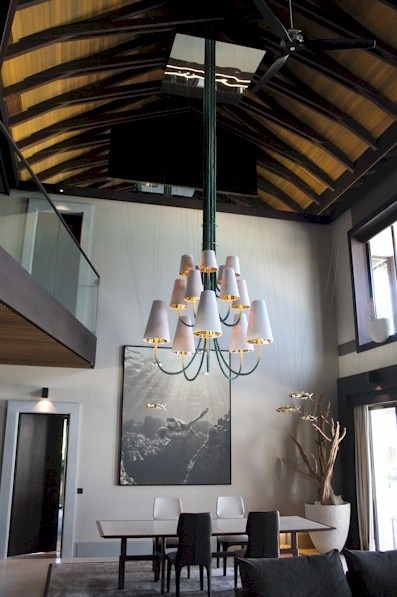 But a few resorts have opted for more creative designs with different aesthetic than the ubiquitous thatch. 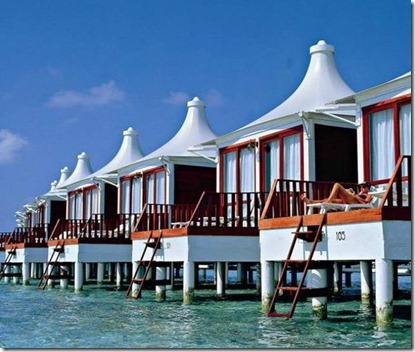 One of the most original in all the Maldives is Cinnamon Hakuraa Huraa’s tented villa roofs. It’s actually not just the roof, but the ceiling as well (see photo above). It gives the villas a light and airy feel to them. And the interiors are very stylishly decorated. Lori is amazed at how many details I can remember from the dozens of resorts we have stayed at, but I must admit that sometimes they do blur a bit in my mind as so many follow such a similar villa look and feel. Hakuraa Huraa is one that is distinctively memorable though. If only the corals could push some button for a bit of cooling shade when they get too warm. 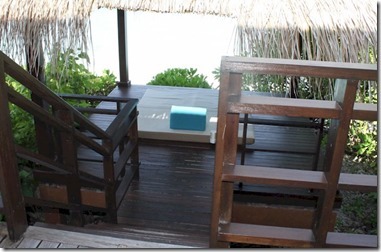 At least guests at Velaa have that luxury with deck cabanas with tops that can be rolled out for a bit of shade or rolled back for sunshine (or starshine if you want to lie back on the deck lounger and gaze at the stars at night). 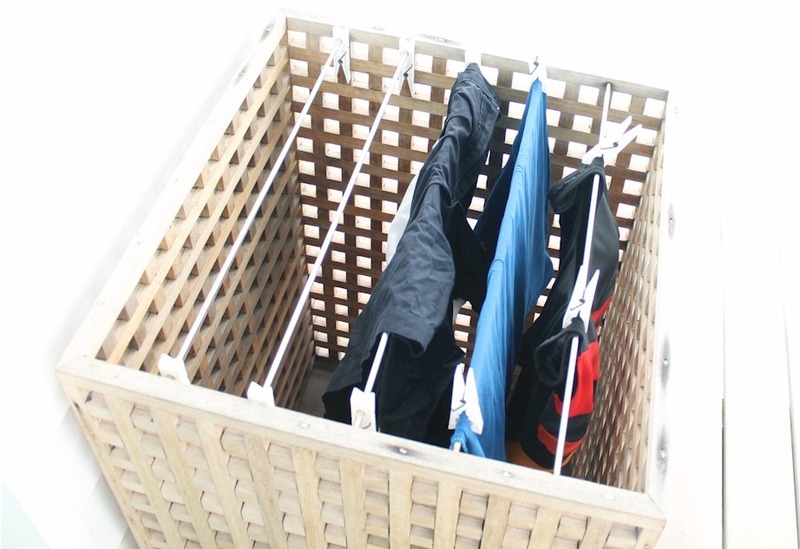 No fans needed to dry your swimsuits at Athuruga and Thudufushi. 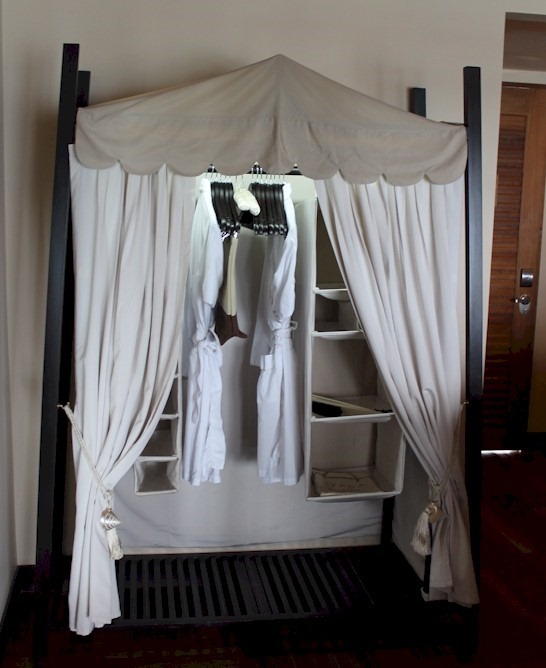 And no draping them over shower rails, retractable clothes lines, setting them out on deck settees (where the breezes blow them onto the sand or into the water). 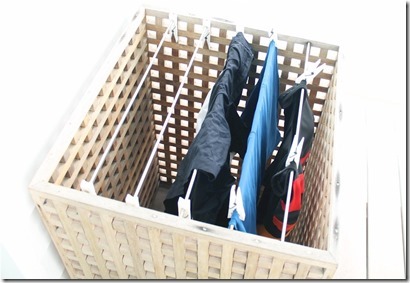 Diamonds has these ingenious drying boxes on the deck (see above). 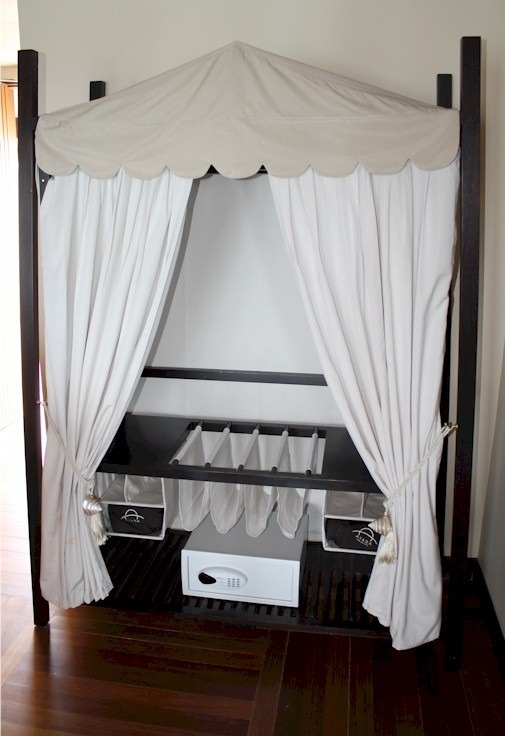 The grates allow the wafting ocean air to dry your garments naturally, safely and discretely (without being hung and strewn all over your lovely villa. 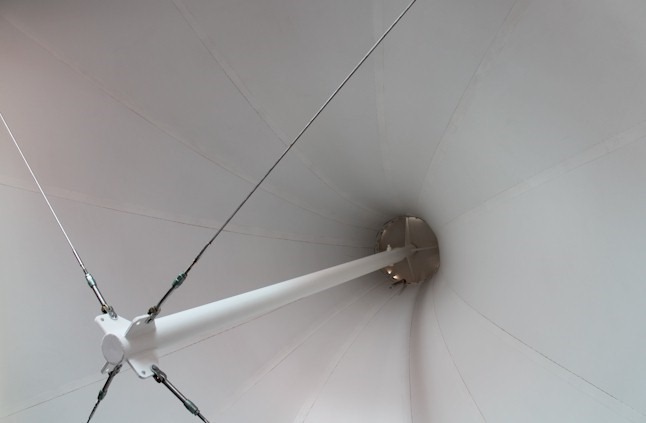 I have a few pet likes – I like the natural cooling wafting of a ceiling fan, I like distinctive design details, and I like natural fabrics and materials. 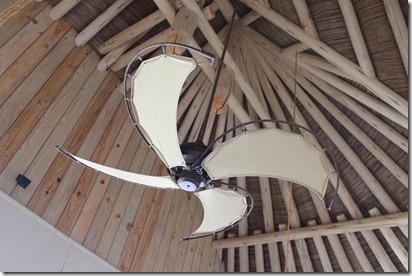 So there wasn’t much for me not to like about Soneva Fushi’s canvas ceiling fan. With its distinctive rough-hewn ceiling timbers, Soneva has one of the most aesthetically pleasing sights for lying flat on your back in your room. 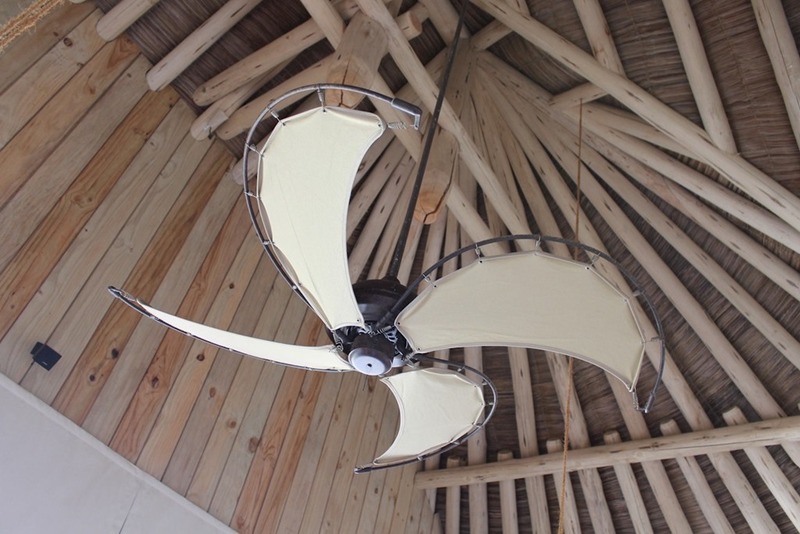 With this post, I’ve added the topic tag “Fan” for other guest with plafond propeller propensities. Selecting possibly the most distinctive wardrobe in the Maldives wasn’t hard. In fact…it was amazingly soft. 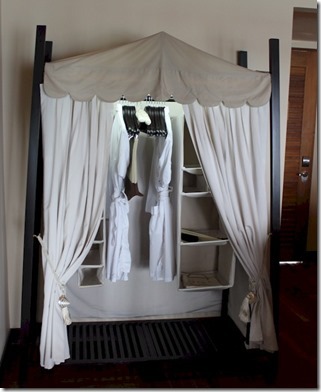 Ayada’s villas are decorated with white cloth armoires are a part of their soft, breezy décor styling. Sort of a Bedouin-chic befitting its occi-oriental crossover motif. 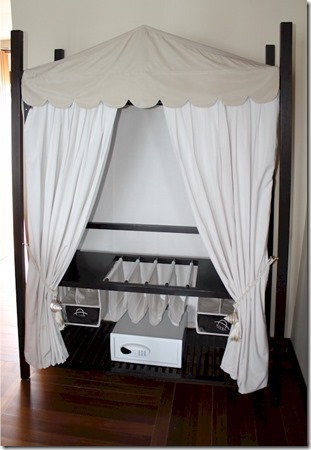 Even the shoe holder and vertical storage pockets are cotton. The land-lubbing fashionistas can find their own cavernous wonder at the super deluxe Velaa’s Private Residence. 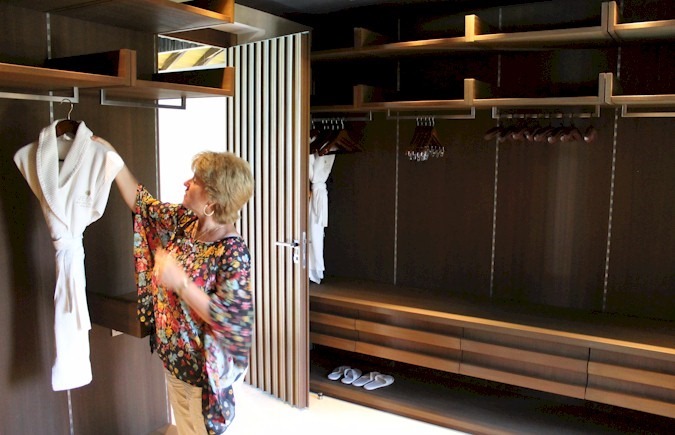 The master bedroom includes a walk-in closet bigger than some villas that we have stayed in. A whopping wardrobe that make Claire Dunphy and Jay Pritchett weak at the knees. 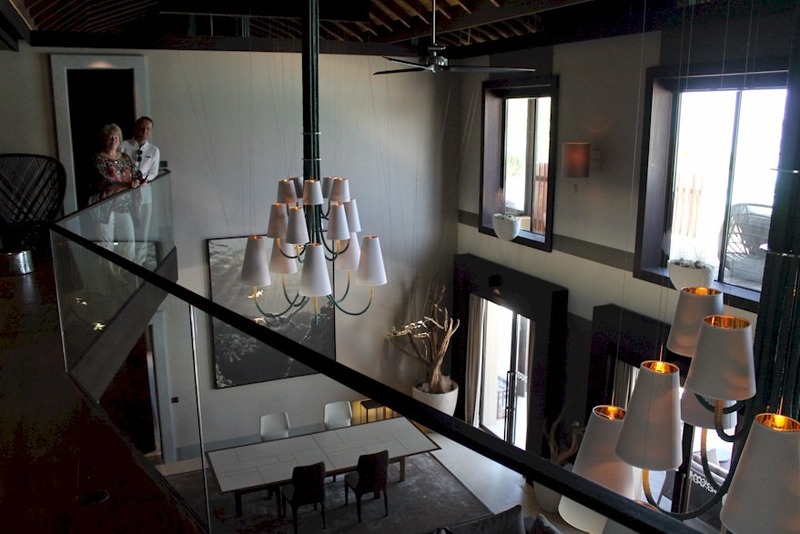 I guess you could say that Velaa’s Private Residence would have the ‘second’ highest ceiling (that is after Soneva Jani’s infinitely high one). 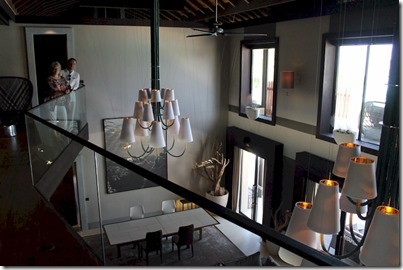 But in the universe of conventionally topped villas, Velaa’s Private Residence headroom is galaxy-sized in its own right. The vaulted ceiling extends three stories up forming a cathedral-like nave quite possibly the largest indoor space on a Maldives resort. The second floor balcony lines one side giving another perspective on this vast lagoon of room volume. 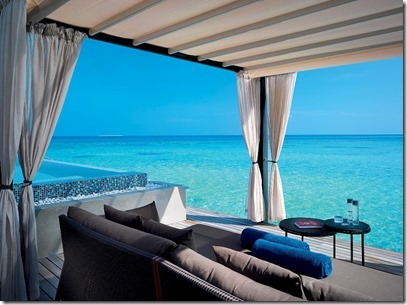 The least transparent villa table in the Maldives doesn’t make it any less aesthetically alluring. 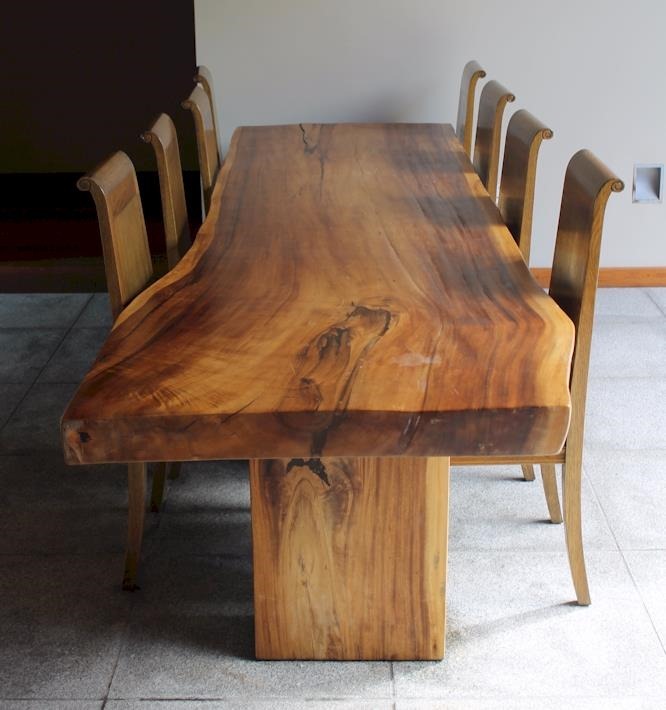 Huvafenfushi’s dining table is another striking CUBE villa feature and reminiscent of the Park Hyatt table that I previously admired (but this one is your very one in your private villa). 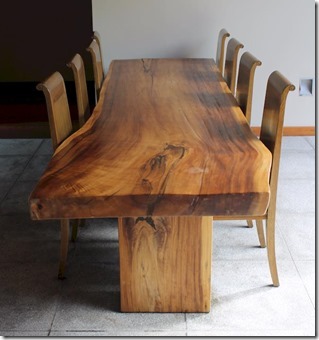 I’m very partial to such natural grain and shape that sits so perfectly in this natural paradise. 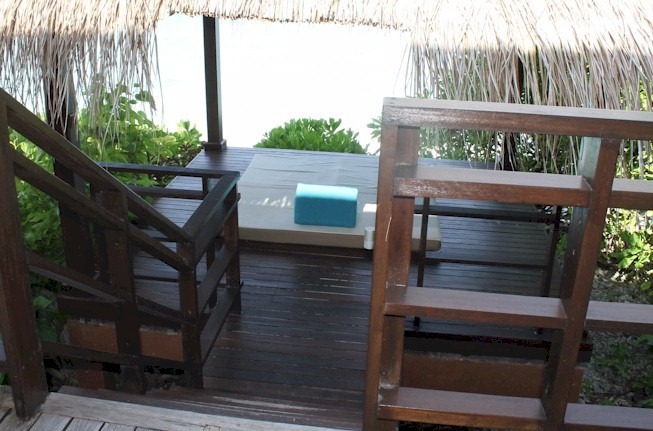 If you prefer a bit more secluded yoga practice in the convenience of your own back garden, then check into a Tree House Villa at Shangri-La Villingili which comes complete with its very own yoga pavilion overlooking the tranquil sea.